Besides the PlaceholderField class, the fluent_contents module also provides additional admin classes to build a CMS interface. The main difference between the CMS interface, and PlaceholderField class is that the placeholders will be created dynamically based on the template of the current page. Instead of displaying placeholders inline in the form, the placeholder content is displayed in a separate tabbar interface. Detecting placeholders from a Django template. Automatically rearrange content items when the layout changes. Allow usage with any parent model. In the source distribution, see the example.simplecms package for a working demonstration. The django-fluent-pages application is built on top of this API, and provides a ready-to-use CMS that can be implemented with minimal configuration effort. To build a custom CMS, the API documentation of the fluent_contents.admin module provides more details of the classes. The start of the admin interface, is the current interface for the CMS Page object. To display the “placeholder editor”, the admin screen needs to inherit from PlaceholderEditorAdmin, and implement the get_placeholder_data() method. # Simple example that uses the template selected for the page. Now, the placeholder editor will show tabs for each placeholder. The placeholder editor is implemented as a InlineModelAdmin, so it will be displayed nicely below the standard forms. 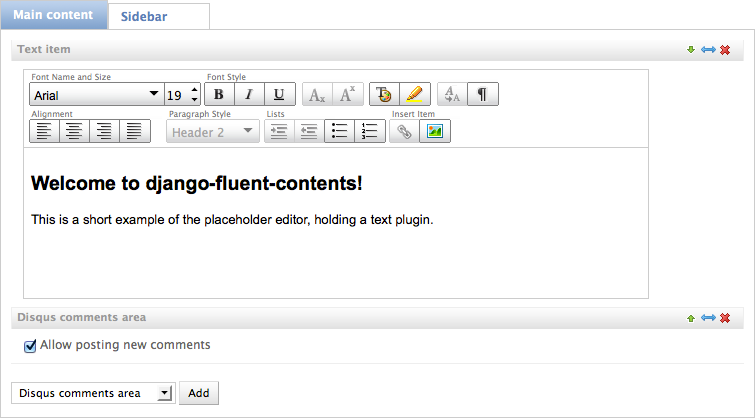 The get_placeholder_data() method tells the “placeholder editor” which tabbar items it should create. It can use the get_template_placeholder_data() function for example to find the placeholders in the template. The Page object of a CMS does not require any special fields. Optionally, the PlaceholderRelation and ContentItemRelation fields can be added to allow traversing from the parent model to the Placeholder and ContentItem classes. This also causes the admin to display any Placeholder and ContentItem objects that will be deleted on removing the page. Register a function this is called when the module initializes the layout for the first time. By letting the handler return true, it will abort the layout initialization. The handler will be required to call fluent_contents.loadLayout() manually instead. This feature is typically used to restore a previous client-side selection of the user, instead of loading the last known layout at the server-side. Hide the placeholder tabs, but don’t remove them yet. This can be used when the new layout is being fetched; the old content will be hidden and is ready to move. Load the new layout, this will create new tabs and move the existing content items to the new location. Content items are migrated to the apropriate placeholder, first matched by slot name, secondly matched by role. The contents of each placeholder item is identical to what the as_dict() method of the PlaceholderData class returns. Show the content placeholder tab interface. Hide the content placeholder tab interface. This can be used in case no layout is selected.